The A4's regular suspension (a Sport suspension is optional) is stiff, which keeps body roll in check, but the tuning isn't so firm that driving on rough pavement is jarring. There's no question the emphasis is on sporty driving, but Audi wisely realizes that a car like the A4 also has to keep its occupants comfortable during daily commutes. With the regular suspension, it does. It's worth noting that our test car had winter tires. While appropriate for the conditions, they likely affected the car's character compared with the all-season tires it normally wears. Winter tires have softer rubber compounds for better grip in cold weather — along with more aggressive tread patterns — which affects handling, acceleration and road-noise levels, among other things. While the firm suspension tuning is common among German luxury cars, the steering feels like it's been sourced from Lexus. At low and midrange speeds, the wheel turns easily and with little effort. Unfortunately, there's also little feedback. However, a pronounced change occurs when you reach highway speeds, where the steering firms up and feels sharper. 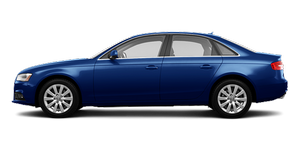 The A4's Quattro all-wheel-drive system features rear-biased torque distribution for improved dynamics. Even though it powers out of corners without feeling nose-heavy, it's still not as engaging as a rear-wheel-drive BMW 3 Series or Infiniti G37.